Specialising in personal injury claims, business law, property law and dispute resolution. Johanna Lacy qualified in 1999 and after moving to Cashel, Co Tipperary in 2004 she opened the Cashel Branch of Nathaniel Lacy & Partners in 2010. Johanna offers her clients a personal legal services that is of the highest quality and value for money. 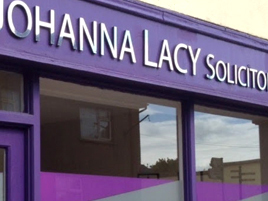 Johanna Lacy Solicitor clients are typically located in Tipperary, Kilkenny, Waterford, Carlow and Dublin. If you are located inside or outside this area please contact us to discuss your legal requirements.